A Barnsley-based craftsman is carving out a new focus for his business by building bespoke furniture for local homes and companies. 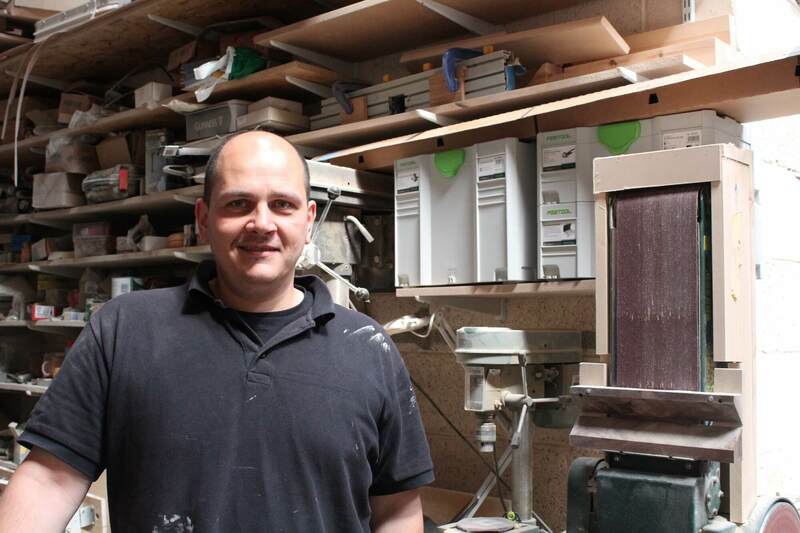 Designer and cabinetmaker Reece Van Sanden, who runs Van Sanden from a workshop in the town centre, has spent the last five years completing home improvement projects for people across South Yorkshire. He originally built his business around services including kitchen and bathroom installations, but is now focusing on his love of creating individual items of furniture designed and made to personal requirements. As well as crafting beds, cabinets, tables, seating and even Wendy houses out of materials including wood, steel, concrete and glass, Reece is often asked to create corporate products such as reception desks, trade show stands and production jigs. He has also designed a line of children’s beds designed to look like show jumps, and counts the pony-mad daughter of a well-known TV personality amongst his clients. Reece, who relocated his business from London in 2011, has been supported by Enterprising Barnsley, the business development and support arm of Barnsley Council. He has benefitted from free guidance from their Launchpad service to help develop the furniture side of the business, attending a marketing workshop at the Digital Media Centre and receiving one-to-one coaching in how to reach more customers. Reece is now being supported to expand his online presence through social media and his website, as well as building and maintaining an email database, and developing a new brochure. He said: “I’ve always relied on word of mouth for my home improvement work, but I needed help to spread the word about the bespoke furniture side. I want people to know that factory-made furniture taken straight from a production line is not their only option. After leaving London to be nearer family, Reece rented workshops in Sheffield and Denby Dale before taking on premises on Doncaster Road in Barnsley. Reece also works with Barnsley business Folio Albums creating bamboo boxes for their luxury products which are sent all over the world. He currently works on his own, but is looking to hire someone as an apprentice- to work with him to learn the craft and help grow with the business. Enterprising Barnsley, the economic development arm of Barnsley Council, provides specialist support to businesses with growth potential. The Digital Media Centre, Barnsley’s flagship creative and digital hub, is part of their portfolio of business support and accommodation. For further information about Enterprising Barnsley, please contact Andrew Ainsworth on 01226 787535 or visit www.enterprisingbarnsley.co.uk.